Rich and decadent, this chilled pie combines two of my favorites- peanut butter and chocolate- for an amazing gluten-free dessert! I’ve been drooling over peanut butter recipes forever. I have more recipes pinned and printed off that have peanut butter and chocolate in them than any other. I could make 2 peanut butter recipes per day for the rest of my life and still not make it through all the peanut butter recipes I want to try! 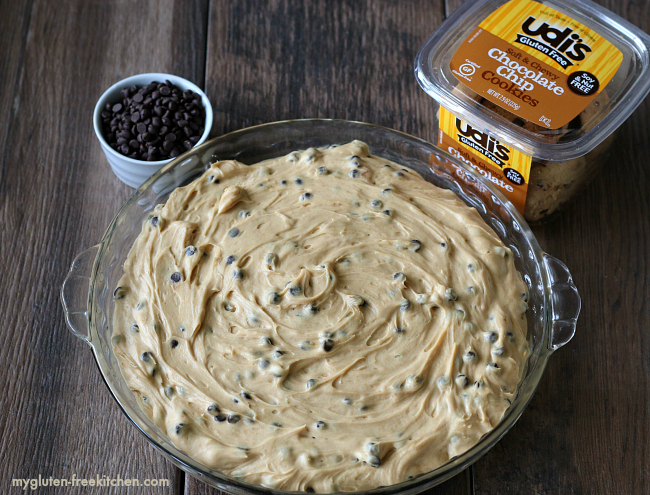 While brainstorming a new recipe to create through my partnership with Udi’s Gluten Free, I started thinking about how to incorporate their chocolate chip cookies in a yummy dessert. 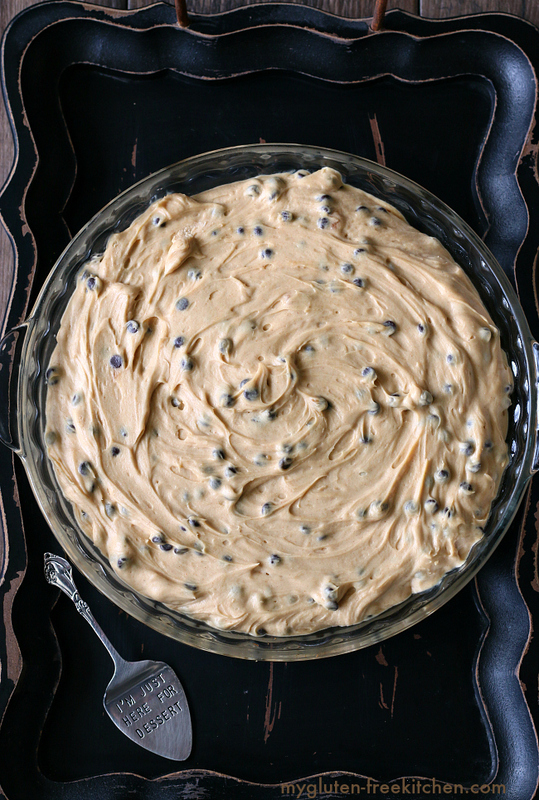 I had a number of ideas, but kept coming back to this idea of a chocolate chip cookie crust. 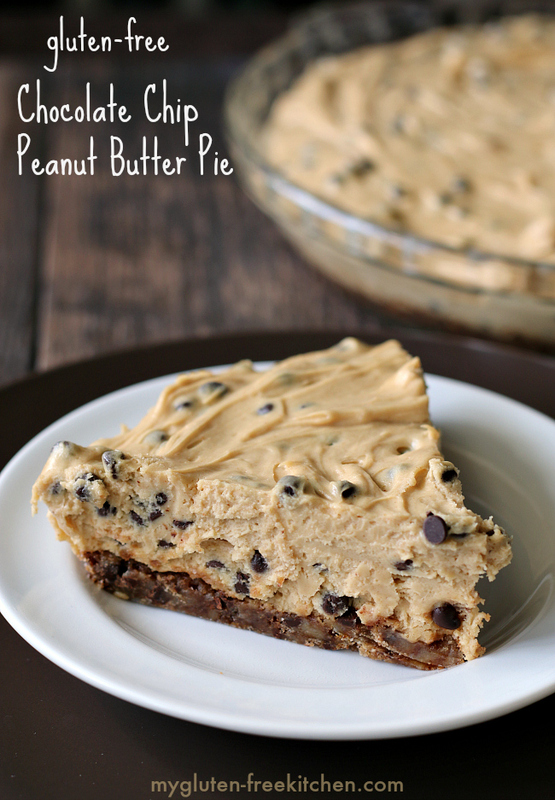 Then I started thinking about peanut butter pie and I thought those would go amazing together. 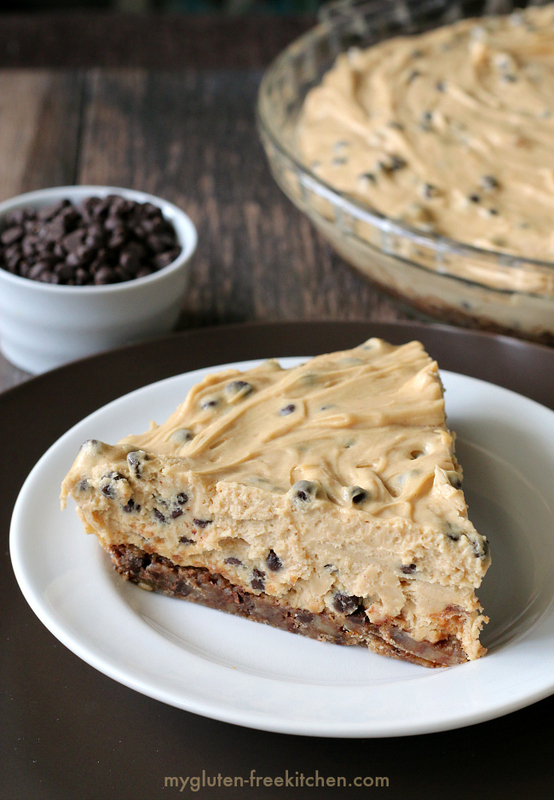 I looked at several recipes for peanut butter pie filling, and finally opted to use this peanut butter chocolate chip pie from Bake or Break as my starting point to adapt from. The crust idea worked just like I had imagined, and with just a little change to the filling, it was just what I liked. Together, I was thrilled to see the dessert that was in my head was so successful and yummy! For the crust, I used Udi’s Gluten Free Soft & Chewy Chocolate Chip Cookies. These worked perfectly to make a chewy cookie crust with barely any effort. The recipe uses one whole container of them, so if you’d like additional cookies to crumble on top or to munch on while cooking, make sure to buy a second package! This is a very decadent, rich dessert. I did opt to cut the fat down a bit by using Neufchâtel instead of regular cream cheese and it worked well. Feel free to use either one. Note that you are not using an 8 oz. block. I found 6 ounces to be the perfect amount for this pie. You can save the extra 2 ounces for when you make these gluten-free chewy chocolate chip cookies, since that recipe calls for 2 ounces of cream cheese! This recipe assumes the use of a peanut butter that has salt in it. If using a homemade peanut butter or store-bought natural peanut butter that doesn’t have salt, add a pinch of salt in Step 1 of making the filling. After you do pulse all of the cookies until you have course crumbs with some cookie chunks in them, you’ll add brown sugar and melted butter and mix together. Simply press into a greased pie plate and bake in the oven for nine minutes. The filling is very easy to prepare with your electric mixer. It took only about 7 minutes for me to mix up the filling, including whipping cream for it. After you’ve assembled the pie, place in fridge to chill for at least four hours, or overnight (which I did) and then you can enjoy! I meant to whip up some additional whipped cream to dollop on top, so feel free to do that if you’d like some! P.S. For those that love the cute server in the photo, this is the newer version: Just Here For Dessert Server. If you want another easy, semi home-made pie making use of Udi’s cookies, check out my Snickerdoodle Streusel gluten-free Apple Pie. It’s soooo good too! Spray pie plate with non-stick spray. Preheat oven to 375°. 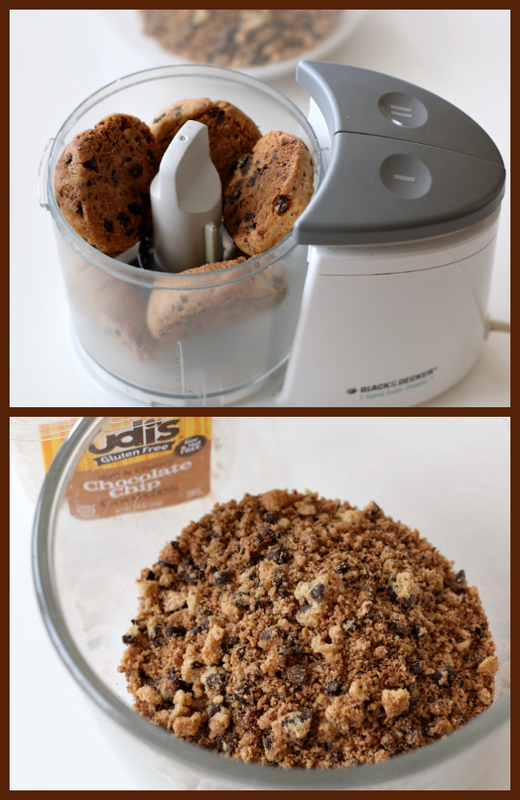 Using a food processor or food chopper, pulse the chocolate chip cookies until mixture is course crumbs with some larger chunks. (see photo in blog post). Transfer cookie crumbs to a medium size bowl. Add brown sugar and whisk. Pour melted butter over cookie mixture and whisk until well blended. Transfer cookie mixture into greased pie plate. Use a spatula or your fingers to press the cookie crumbs firmly across bottom of the pie plate. Bake in preheated oven at 375° for 9 minutes. Remove from oven and set aside to cool while you make the filling. In the bowl of your electric mixer, beat the cream cheese, peanut butter, powdered sugar, and vanilla extract on medium speed until combined. Mixture look like a peanut butter cookie dough. In a separate bowl, use an electric mixer to whip the heavy whipping cream until soft peaks form. Scoop 1 heaping cup of the whipped cream and add to the peanut butter mixture. Beat on low speed until mixed thoroughly. Scoop remaining whipped cream into the peanut butter mixture and use a spatula to gently fold the whipped cream until mixed in. Scoop the filling into the cooled crust. Place in refrigerator for 4 hours or overnight. This is very rich so you'll want to slice this thinly -not like the slice in the photo! This recipe assumes the use of a peanut butter that has salt in it. If using a natural peanut butter without salt, add a pinch of salt in Step 1 of making the filling. Oh. My. Goodness. That pie looks absolutely amazing! I’m definitely making this, I know my family would love it too! Making crust out of chocolate chip cookies??? Brilliant! This pie looks amazing! If I show this recipe to my husband I’m going to have to make this weekly. It looks so good! Such a creative fun idea!!! This is something I know my mom would go crazy for! Wow wow wow!! Little Miss would love me forever if I made this for her using SunButter in lieu of PB! Looks amazing, Michelle (as always!). Do you think it will work with dairy-free cream cheese? This pie is all sorts of amazing, Michelle! I really, really, really want a slice or 2. This looks so good!!! My family loves chocolate + peanut butter. Such a delicious flavor combo! The crust recipe does not work!! The cookies and brown sugar are swimming in butter! 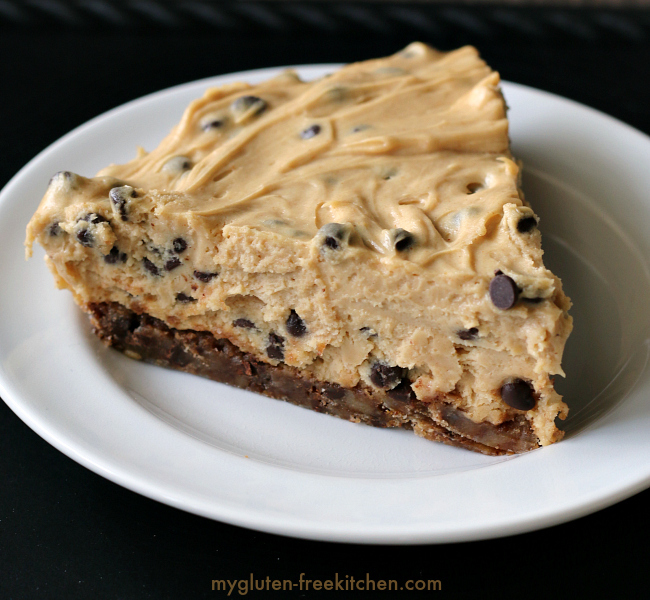 This is a dream pie, whether you follow a gluten free diet or not! My kids would go crazy for this. This is seriously the most drool worth recipe I’ve seen in a LONG time. I’d have ZERO willpower around this pie! This looks amazing! Do you know of a way to make it dairy free maybe? House full of lactose intolerant people, lol! Any ideas for making this dairy free? What could I substitute for the whipping cream and cream cheese? i made this for Thanksgiving. It was delicious!!! Everyone was all over this pie (glutenites and non alike!)!! I couldn’t get a hold of any udis cookies, so i used Pamelas instead, worked perfectly. Hi – if I don’t use these exact cookies but use a crispier type cookie, still chocolate chip but not soft and chewy, should I add more brown sugar or butter to help soften? Yes, I think that would be a good idea! But it really shouldn’t take much – maybe an extra tbsp of butter? And no more brown sugar.